at a home improvement store. My plan was to do 0 research, and just whip out the photos and ask for help. 2) The next time I happened to be at the Burbank Lowe's (I prefer Lowe's to Home Depot just bc it seems like less of a rip-off), I went over to their small thermostat section. At first I was overwhelmed, and their poster did not help at all. Apparently you're supposed to know what kind of HVAC system you have in the first place. I took out my phone, and there it said: HEAT PUMP. Who know that's a type of system!? Thankfully it was written on the old thermostat twice, and there was an "EM HT" button that convinced me that I had a Heat Pump with Emergency Heat kind of system. Once I narrowed it down, I picked the most on-budget, least ugly thermostat. It's the Honeywell 5-2 Programmable Thermostat. BDF kept trying to convince me to buy a smaller thermostat, but I knew the size of my old one, and I wanted to avoid painting if possible. There was also a long discussion about programmable thermostats vs. nonprogrammable. I went with the kind that has the same "program" for weekdays and another one for weekends, but I fully intend to never use the program features. I just bought it for its potential added value for future house selling. 3) Honeywell promised me via the labeling of the box that in 15 minutes, I would have a new functioning thermostat. Honeywell exaggerated a little bit, but altogether it took me about 30 minutes for the next steps. 4)Attach the pieces layer by layer. The trickiest part is figuring out where the wires go. You'd think it's as easy as putting A with A, B with B, etc., but it's a little different according to the kind of system you have. It's all in the manual though. Easy as reading. 5) After the hardware was installed, the biggest hurdle was figuring out if it was gas vs. electric powered. 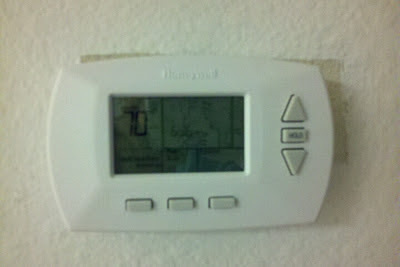 You need to know this in order to program the thermostat. I stared at the heater thing in the little closet for a little bit, but I couldn't tell what it was. In a moment of semi-genius, I remembered that the home inspection back from when I was in escrow had all the details about the HVAC system. I looked it up, and it turns out that mine's electric, not gas. Please excuse the horrible cell phone photo. 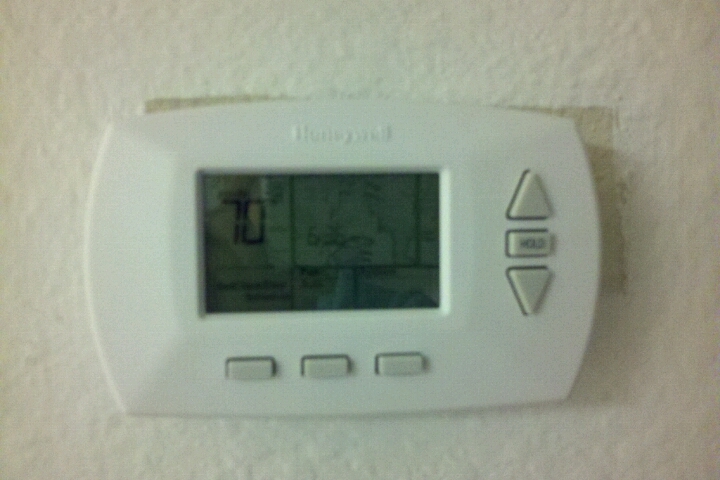 For $50 and not much time, a new thermostat was had and heat was enjoyed at an accurate temperature by all! It was easy, and in my fake difficulty scale, I give it 1 star. As you can see, in the end I have to paint around it anyway, since the holes didn't match up, but I've been too lazy to do so yet. Boo hoo. Basically if you have logic and you can follow instructions, it's pretty much doable. Girl power.